This is the most challenging topic that I have so far attempted to write on for the weekly Friday 2 on 1 blog posts where Shackman and I write on the same topic. Please go over to his blog to see what he has to say on the topic that he has suggested. be resentfully unwilling to give or allow (something). It is most challenging for me for the simple reason that for the world of it, I cannot think of even one grudge that I ever had leave alone grudges. And, I am serious. I can neither think of the noun nor the verb to come up with any thing that I can write up on. Perhaps I have just been very fortunate or simply that I am made that way. I do not know and now at the age of 75 I do not want to speculate on why I have been so fortunate. My apologies Shackman, I hope that I have not disappointed you. I think grudges are a waste of time — it’s better to learn from the situation and move on rather than keep yourself stuck and feeling victimized. I think a grudge can be several different things – the persistent ill-will you mention, but also the kind of obsessive, irrational hatred that completely takes you over, and also the desire to take some sort of action that expresses the grudge. I have persistent ill-will against my father, but it never developed into the other types of grudge. Grudges that turn into pathological hostility are very self-destructive. I can understand the differences and can also readily think of examples of both kinds, though not in me but, in others. Like you, Ramana, I don’t hold grudges. It’s not in my nature. Though, whilst on the whole I am glad I don’t, I sometimes wish I did. It would make it easier for me, to use Jean’s lingo, “to move on” instead of trying to flog dead horses. However, here’s a thought: Even if you and I don’t hold grudges what about grudges held against us? No bull, Ramana, there are people (not least in blogland) who will lovingly tend to their grudge(s). For years. Till, in the mist of time, anyone will be hard pressed to even remember what brought the grudge on in the first place. But it’s there, established like a stubborn weed. Never mind. I pity holders of grudges, the calcified, unyielding. They’d probably rather choke on their grudge than shake hands and make up. Surely, it is their problem? Why should it matter to either or both of us? My response to her apples here as well. I too quite enjoy Ursula’s “discussions”. The question remains. In this case is she holding on to a grudge or what else would you call it? That has nothing to do with some people liking her interactive style and some people not liking it. People don’t have to be liked by everyone. 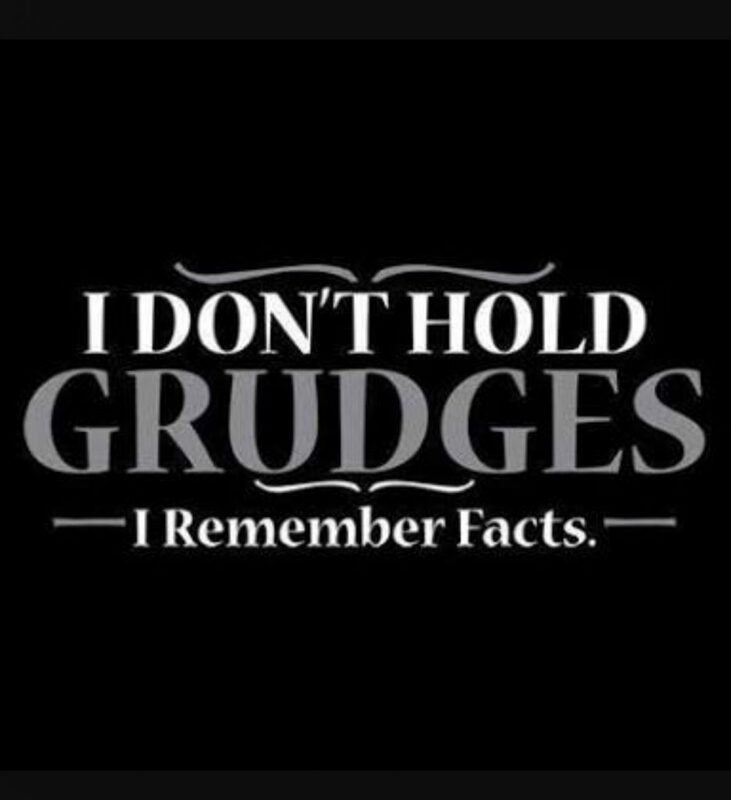 I have a whole different view of grudges apparently! I think everybody has them. now a ‘vendetta’ is something altogether different. I know I have no vendettas. I can see how deep grudges could result in vendettas! that’s not good at all. I think of a grudge as not being unable to ever forgive the person and forget whatever they did or said and just move on. so I won’t belabor it here. and I wouldn’t be offended if you’d like to delete it Shackman! it really is too long. I can’t speak for Shackman, but I read your comment and loved it. Go, tammy! I can see where you come from and have left a response to your comments at Shackman’s post too. And Ursula, you say you never hold a grudge, but you also seem to be saying that your intentions are always benign so if people take offense it’s because of defects in them, they are exceptionally needy, needing constant validation and unquestioning adulation. OK, even if that is/were true, you say you are having trouble letting it go and, as I recall, have even written blog posts disparaging them. That comes across as you feeling “ill will or resentment” towards them. If it isn’t a grudge, what would you call it? That some long forgotten incident can crop up and lead us to wonder why we reacted the way we did then is accepted. If they did not, we will not be human! Carrying grudges (or gunny sacking), planning ways to get even, then carrying them out successfully or not, is all a waste of time and energy, I think. Why clutter up my thoughts by focusing on someone, or their actions, that only create ill feelings in me? Why give them that power? “Killing with kindness” — not to be confused with weakness — can be healthier. Ah, killing with kindness and turning the other cheek! Long time since such ideas were thrown around! And thank you for introducing me to “gunny sacking”. Very interesting. Killing with kindness is not to be confused with turning the other cheek. Agreed but they both indicate different to holding a grudge reaction patterns. But it’s an art, learned through patience and practice, isn’t it? I can’t say I’ve NEVER held a grudge. But anger and even hatred are not the opposite of love. Indifference is. So you have to ask yourself, if you’re feeling negative feelings, is it because the relationship still matters, that much, to you? If not, let it go. As someone once said, “Nurturing resentment is like giving your enemy space, rent free, in your head.” Why do that? As for parents and even others, i find it intriguing to consider what their experiences might have been growing up that may have influenced their behavior — only for understanding, but not as an excuse. This may allow for some tolerance and compassion since we can only change our feelings, not theirs, to create our healthy state. 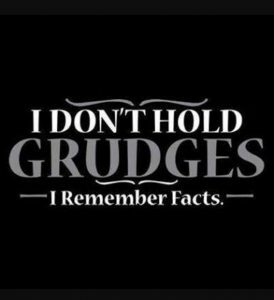 I don’t think I carry grudges in the sense of wanting to get even. But certainly there have been times when someone has been hurtful enough that I make every effort to avoid them or remove them from my life. And then every effort to let go of the hurt of anger that lead to that decision. I imagine that the strategy is what most of us follow though some people do tend to carry grudges to their graves! There are cultural communities that hold grudges for hundreds, if not thousands, of years. Seems a pointless waste of a very short life, if you ask me. Unless the underlying reason for the grudge is perpetuated and driven into your soul like a coffin nail even today. Something that stands out in my mind: We fought a bloody Revolutionary War with England, just over 200 short years ago. In the last century, we fought together as allies against fascism. On 9/11, the Queen of England ordered them to play our national anthem in front of Buckingham Palace. We’re better off finding paths to friendship and peace, I think. We have that connection with the UK too and despite having suffered much more as a colony than the USA did, I can honestly say that Indians do not bear a grudge against the British. In fact, quite the contrary, I should say. Don’t have grudges? Well, you are very fortunate. That I am Tikno and I am delighted to see you back in the blog world. I hope to see more of you in the future too. I’m just difficult in managing time for blogging because of my work. But I still like to read blog posts. Holding a grudge is extremely damaging—but only to yourself! Once you figure this out, the rest of the ‘letting go’ process is easy! I come from a very large family, so I guess the opportunities to be hurt and to hold a grudge later are many. My process for addressing grudges has always been: Talk it out, Forgive, Let go. Works every time! Yes, that course of action would work every time. Another thing we have in common. I don’t know the feeling, or that state, either. Naturally, I do not expect you to have the time to start with!